For the Christchurch Symphony Orchestra, music and the arts are for everyone, regardless of who they are or where they live. 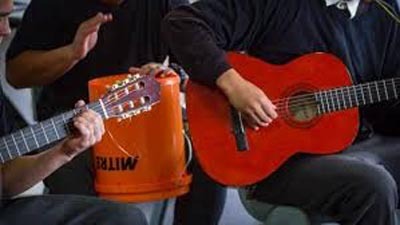 Through our Community Engagement Programme, we’d been taking live music into schools, retirement villages, libraries and community halls, and we wanted to take it even further by bringing it to Corrections facilities. The problem was, we didn’t know where to begin. 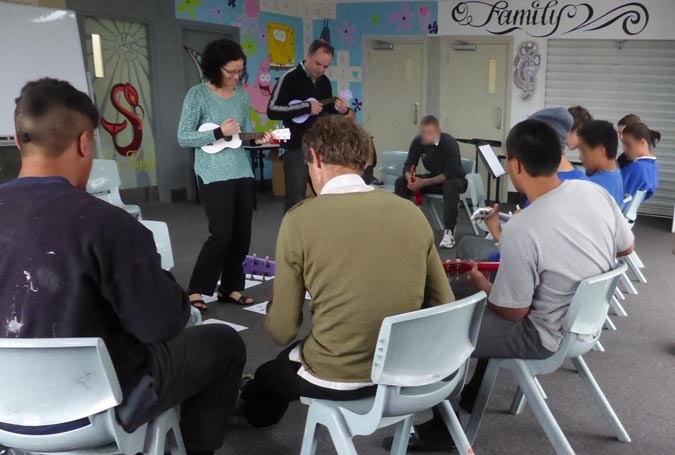 In 2016, we embarked on a project that would bring music to young offenders in Christchurch Men’s Prison. That year, we were Highly Commended in the Arts Access CQ Hotels Community Partnership Award with our project partnerships with Jolt Dance, an inclusive company in Christchurch. 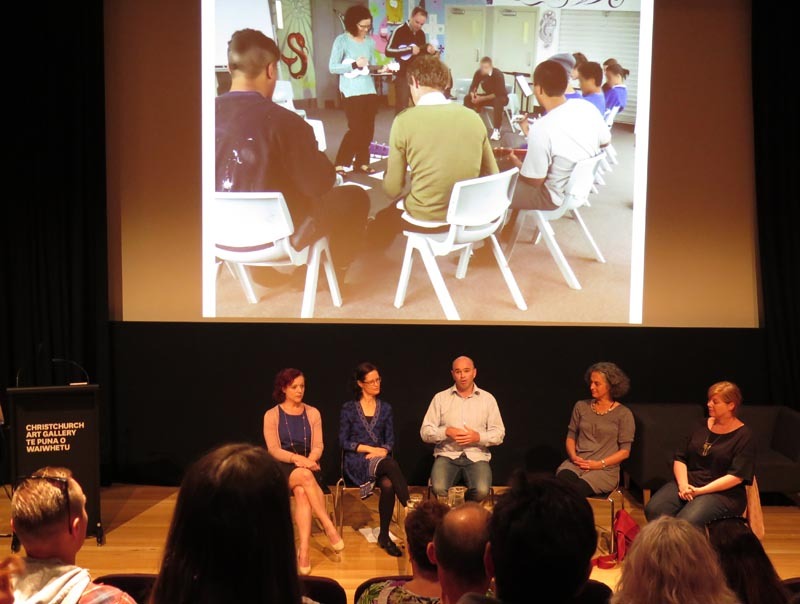 Last month, Arts Access Aotearoa asked me to talk about this project at a combined meeting of the Arts For All Canterbury Network and Arts in Corrections South Island Network. This blog covers the highlights of that talk. At the Arts Access Awards, held in Parliament, we met people doing arts projects in prisons. Then we met Carey Ewing, manager of Pathway Reintegration, which runs a reintegration programme for offenders. Through Carey, we made contact with Youth Interventions Coordinator Luan Smith and Principal Corrections Officer Gary Smallridge at Christchurch Men’s Prison. They were passionate about including the arts in their rehabilitation programme for youth offenders. Thus the Karawhiua Arts Programme came about. Before putting the project into action, we were briefed on the backgrounds of the participants. Many of these young men had low levels of confidence. Generally, they had few ambitions and had experienced dysfunctional childhoods; didn’t have many positive role models; had limited formal education; short attention spans; and a distrust of adults. We had to understand t heir needs in order to connect with them and create a programme that would be meaningful to them. One of the things we did was learn their names. This was a way of showing respect for them as individuals, and it helped to build trust between the tutors and the young men. The programme ran for a week, with one two-hour session each day in which we practised and rehearsed musical projects that they would then perform for the rest of the unit, Corrections officers and their families, who had been invited to come and see them perform. Each session was introduced by Carey, followed by break-out tutoring groups and then ending with a reflection session, also led by Carey. At times, this could be challenging. All the men had different abilities and we had to develop projects they could relate to and that were achievable but challenging enough to be rewarding. At the start, there were some who would only give things one attempt before giving up, believing they couldn’t do it. Therefore, we broke up the projects into smaller, more achievable chunks, split the participants into breakout groups, and gave as much one-on-one tutoring as possible. We also got some of the more able participants to become leaders and help the others with their projects. The performance was a huge success. We had a variety of projects, including playing a drum fugue on plastic buckets, a body percussion piece and playing Over the Rainbow on the ukulele. Three of the men, whom we discovered during the week were actually accomplished guitar players, performed a stunning rendition of The Eagles’ Hotel California. The greater success, however, went beyond the concert. During the week, the men stepped outside their comfort zone to try something new. They communicated in a constructive way with their fellow participants and their tutors. They learned to push through to overcome challenges and achieve. They experienced success and learned that other people had faith in them too. To celebrate their achievement, we put on an afternoon tea and presented them with graduation certificates. It dawned on me how important this recognition was to them when, afterwards, I was tidying up and I inadvertently gathered up a certificate belonging to one of the men. He approached me and was very concerned about where it had gone. This showed me just how important being a part of something like the Karawhiua Arts Programme had been for him. Cathy Irons is a violinist with the Christchurch Symphony Orchestra and Project Leader of its Community Engagement Programme. Original generation time 1.3720 seconds. Cache Loaded in: 0.0538 seconds.